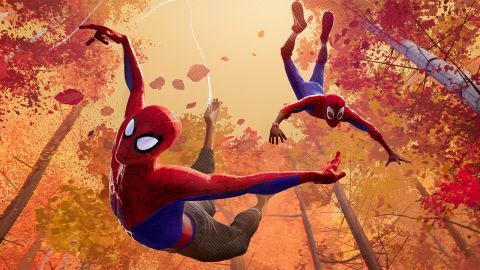 Spider-Man: Into the Spider-Verse review: "A joyful, trippy new incarnation"
A joyful, trippy new incarnation of Spider-Man that you didn’t know you needed, brimming with wit, soul and jaw-dropping visuals. Amazing. Of all the characters in all the fictional universes, Spider-Man feels like the one least in need of another new spin. The character’s been done in live action three times in recent memory, and is currently in very rude health in the form of Tom Holland’s MCU-traversing Peter Parker. Into the Spider-Verse gleefully obliterates this assumption with a smart, funny, dimension-crossing adventure, one that introduces a new Spidey alongside some familiar iconography and tropes. It’s also visually astonishing, bringing the dynamism of the comics to life in a way that surpasses the live-action efforts. It’s jointly directed by Bob Persichetti, Peter Ramsey, and Rodney Rothman, but the hallmarks of producers Phil Lord and Christopher Miller are all over this punky take like graffiti (Lord came up with the story and co-wrote the screenplay). Spider-Man: Into the Spider-Verse has an irreverent ‘meta’ tone, reminiscent of Lord and Miller’s 21 Jump Street and The Lego Movie, but it also has unexpected heart and thrilling action. And it’s very, very funny, skewering Spider-Man with the same irreverence The Lego Batman Movie slayed the Dark Knight. Our lead Spider-Man this time around is Miles Morales (Shameik Moore), an alternative webslinger who’s been in the comics since 2011. He’s not as much of a tech nerd as Peter Parker, but he’s smart, likeable, and struggling to feel at home in the elite boarding school at which he’s won a place. Having a father who’s a cop isn’t making his adolescent years any easier, either. Of course, he winds up being bitten by a funky-looking arachnid, and... you know the drill. Or not quite. Because Miles also gets caught up in a disaster involving an atom collider that tears a hole in the space-time continuum, introducing him to a schlubby Peter Parker from a parallel universe (given pitch-perfect cynicism by Jake Johnson’s croak). It’s up to this paunchy mentor to show Morales the ways of the web and help him get a sticky-palmed grasp of life as a hero. Miles and Peter aren’t the only two Spider-People on the scene though. The disruption of the space-time fabric also brings Gwen Stacy/Spider-Woman (Hailee Steinfeld) into their orbit, as well as other Spider-characters from the multiverse. If on paper it sounds overly complicated, on screen its surprisingly elegant. It helps that the action is grounded in Miles’ dimension, and the goal for him and his superteam is a simple one – stop that particle collider going off again and turning Brooklyn into one giant glitch. Miles has a gratifyingly slow-burn origin, as far as these things go. He doesn’t instantly take to his gifts; the mind is willing but the superpowers are hard to master. Along the way he learns some lessons about what it means to be a hero, but the filmmakers manage to make these moments feel heartfelt rather than sappy. It helps that the voice cast is ace, nailing the comedy as well as the more emotional moments. Brian Tyree Henry and Mahershala Ali, in particular, bring real gravitas to their supporting roles as Miles’ father figures. Nic Cage, meanwhile, is a delight as Spider-Man Noir, a black-and-white Spidey from the ’30s spouting era-specific one-liners. Visually, the film eludes comparisons to anything that’s come before. It’s a pop-art comic come to life, and the zip of its editing and montages recalls the energy of Edgar Wright’s work. Imagine a comic-book panel that’s been rendered in 3D and animated in stop-motion. Characters are shaded with Lichtenstein dots and lines, but remarkably, this doesn’t hold you at a remove: the stylised faces are etched with feeling. Meanwhile, the villains live up to their exaggerated comic-book silhouettes: check out Liev Schreiber’s Kingpin, who’s built like a triple wardrobe, or the monstrous Goblin. When the visuals are this impressive, you might expect it the film to lack substance, but not so. Amid all the invention there’s a plenty of heart – not just in Miles’ story; all the Spideys are sensitively treated – and a satisfying arc. Existing Spider-Man fans will no doubt get more out of it, given that it’s loaded with familiar villains, Easter eggs, and references, but it deserves to be seen widely. And while there are hints that the story could continue (this is a multiverse, after all), it works as a satisfying one-shot – it feels like a full meal, rather than just a starter, which is rare for a potential franchise-starter these days. Forget the quantum physics and dimension-hopping: the most impossible thing to believe here is that Spider-Man feels exciting and new again.